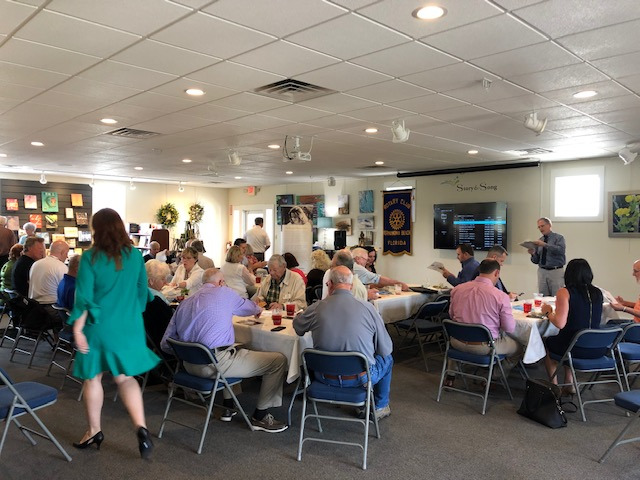 Come visit the Rotary Club of Fernandina Beach, doing good things since 1926! 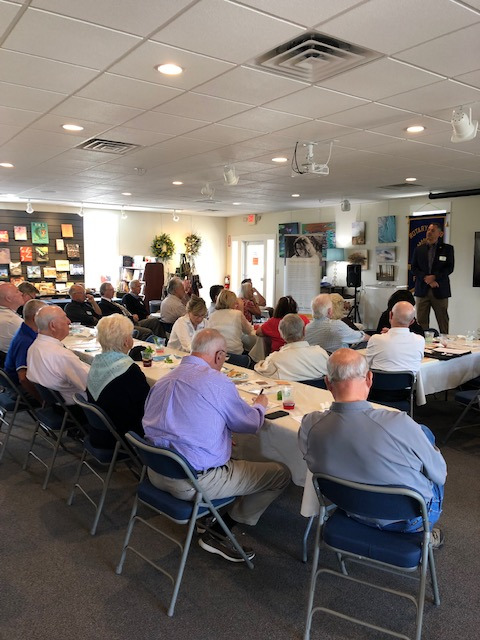 In attendance were 32 Club Members. 36 total attended the meeting. 50/50 Jack Pot: @$ 221 - Rotarian Dr. David Page had the drawn ticket and pulled the "Ace of Clubs" ! 39 cards remaining. No Report - But Great Baseball Trivia! 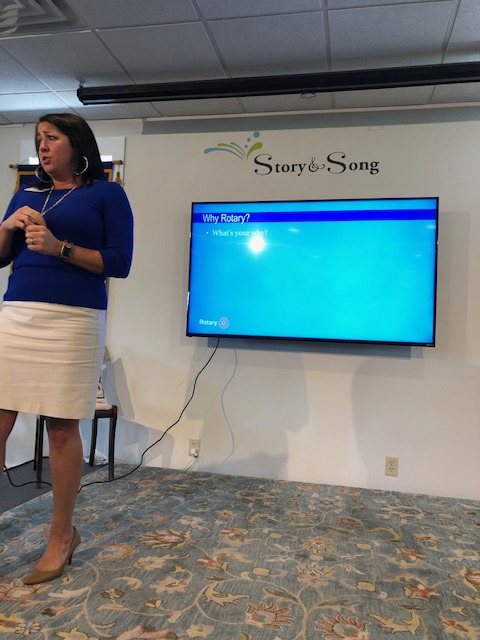 Antoinette wowed us with her President-Elect Training information and what some of her plans are for the coming year! Waiting on John to give us an update on the Blood Drive Results from this past Wednesday at the Nassau Health Food Store. Dr. Page has agreed to host Friday nights gathering at his home. Thank you Dr. Page!!! 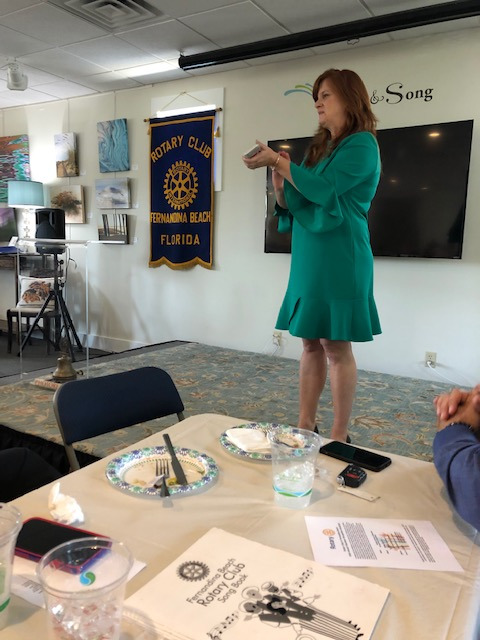 Talked about teaming up with the Sunrise Club to attend a Jumbo Shrimp game in a booth to celebrate Rotary, make new friends and show unity in our vision. More information forthcoming! Advertising is being promoted through various channels - the Chamber of Commerce, community organizations, and online. We anticipate approximately 200 - 250 attendees. There are will be a need for approximately 15-20 volunteers during the day of the event - to help direct, seat, and break down the event. I am working with both Interact clubs to provide help, but the 12th is a school day - most of the students will not be able to miss class. 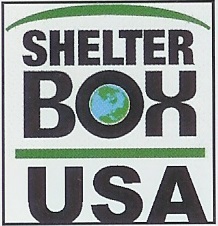 We'll be reaching out to the other Rotary Clubs (Sunrise and Yulee Satellite) for assistance - more to come on that. 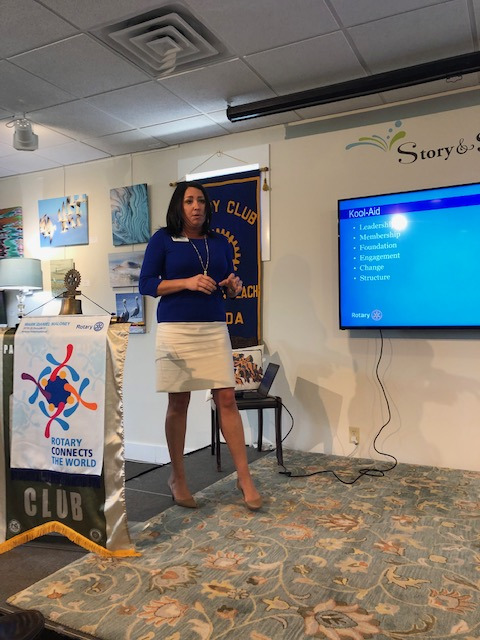 Antoinette called the above "The Kool-Aid"
One by one she went over each category as it related to our club and some interesting idea's on how we as a club would address each one of these area's during her Presidency. 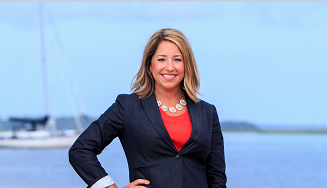 She asked us all, why Rotary? What is your "Why?" We heard a few interesting stories. Then we were asked, What was your Rotary Moment? We heard some interesting responses to that question. Antoinette wants all of us to ask these questions to ourselves and write down the answers. Interesting tid-bit was when she told us that Rotary had 1.2 million members around the world. That number seems impressive by itself however, that number has changed in a decade. I guess there is only a member replacing a member and somehow, we should figure out how we can grow our memberships! For those who haven't been involved in leadership or committee of late, what board or committee could you do to be more active in your club? Antoinette will give us more information as we move forward as a club. Until then, we have a great start for the coming year of her presidency. I'm confident it's going to be a good one. 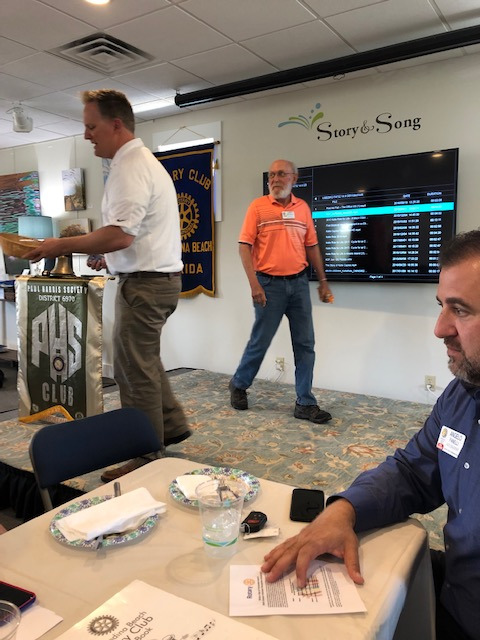 Followed by singing: "You Are My Sunshine"
Visiting Rotarians: Rotarian Bob Ward from the Ada, Ohio. 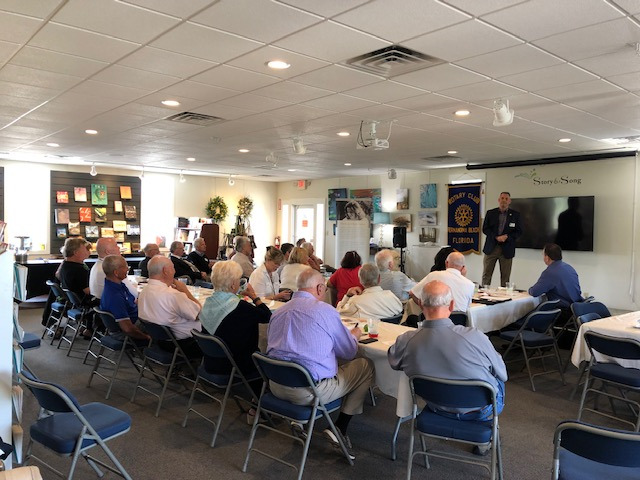 Sergeant at Arms Rotarian Larry Melnick in the orange shirt. 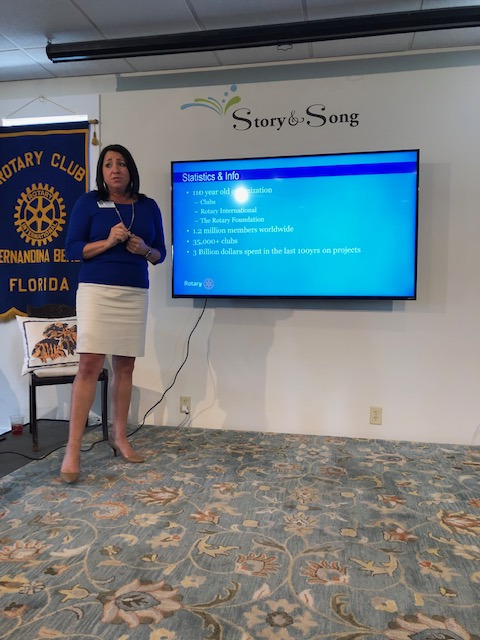 Antoinette attended her President-Elect Training in Orlando last week and will present her experience there to the club this coming week. Next Blood Drive is scheduled for NEXT MEETING this Wednesday. We need more volunteers please! 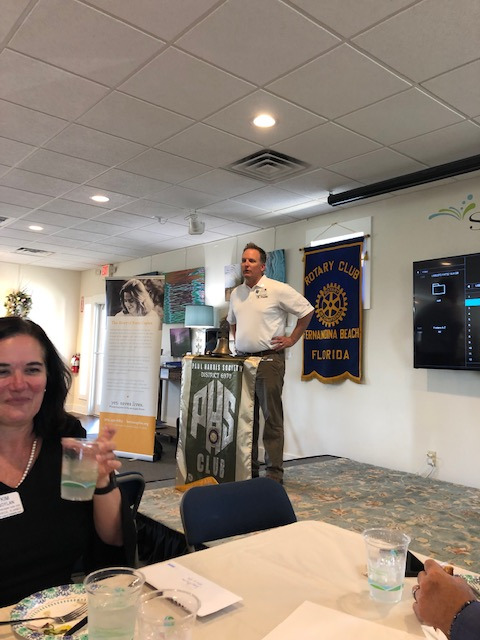 Speaking to the Club was Rotarian Sean McGill, Katie Ride Event Director and Amy Reese, a donation program consultant with Lions Eye Institute for Transplant & Research and a Board member of the Katie Caples Foundation. 120,000 and children are currently on the national transplant waiting list. 95% of Americans support organ donation, but only 54% are actually registered organ donors. 92 people receive an organ transplant every day, on average. 22 people will die each day while waiting for an organ transplant. 97% of organ donor registrations occur at the DMV. Finally.....Every 10 minutes, another person is added to the waiting list. Amy has devoted the last 13 years of her career to educating individuals on the importance of organ, tissue and eye donation. 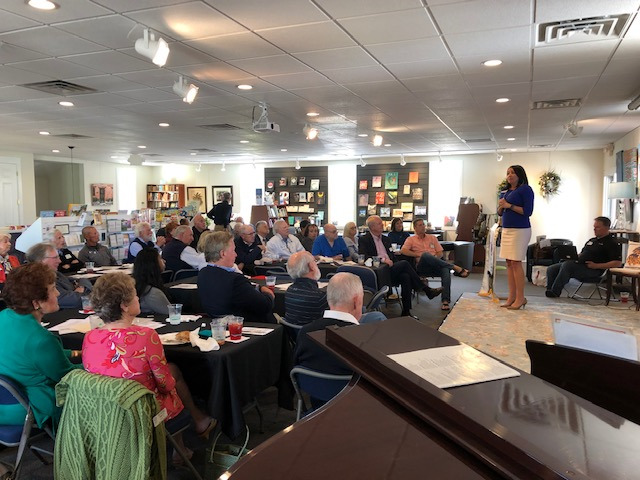 She uses statistics, facts and individual stories to connect audiences to the lifesaving message of donation. That said, Sean and Amy brought everyone up to date starting with a short video of "Katie's Story" to how many lives have been saved because of this amazing young lady who tragically lost her life in a terrible accident in 1998, she was 17 years old. Katie had just become a licensed driver and she had made the decision on her own to become an Organ Donor! Her ultimate act of generosity saved the lives of five (5) individuals who ranged from 9 to 62 years of age and further enhanced the lives of many others. The Katie Caples Foundation is committed to increasing the number of registered organ donors and eliminating the wait for the more than 125,000 adults & children in need of a lifesaving transplant. You can read much more about Katie on the Katiecaples.org website. 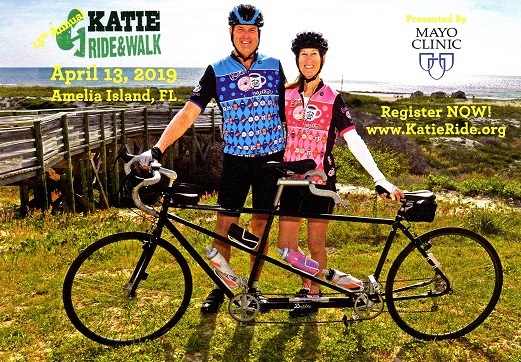 On Saturday, April 13th, on Amelia Island is the 15TH ANNUAL KATIE RIDE presented and supported by the Mayo Clinic. You or your business can become an Official Sponsor. Go to the website and sign on to the event and select a sponsor option such as a Medal & Lanyard Sponsor, a Water Sponsor, a Post Ride Celebration Sponsor, Route Sponsor, or to just making a donation that best fits your budget. Volunteers - Always need volunteers because they can't do this without them. If you are interested in volunteering, please go to the KatieRide.org web site for details. Sean and Amy invite all of us to join them for the 15th Annual Katie Ride benefiting the Katie Caples Foundation's organ donor awareness education and registration programs. The Rides cover routes form 18 to 63 miles, an 8K walk, a fun run and a fun triathlon (300 yard pool swim, 18 mile bike ride and a 5K run all on Amelia Island. Thousands of lives have been affected by the decision 17 year old, Katie Caples made back in 1998 and thousands more are still to come. We want to thank Sean and Amy for their time and the hard work they are doing for the Foundation. 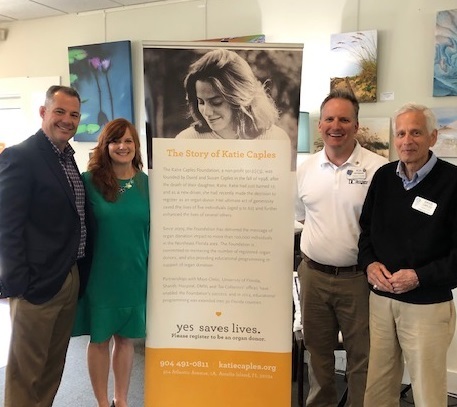 Also, our hearts still go out to Rotarian David Caples and his wife for their great loss and the courage they found early on starting the foundation and making this all happen in Katie's name. Amazing parents, you are!! President Ron Heymanncalled the meeting to order. Dr. Page lead the club singing a patriotic song. 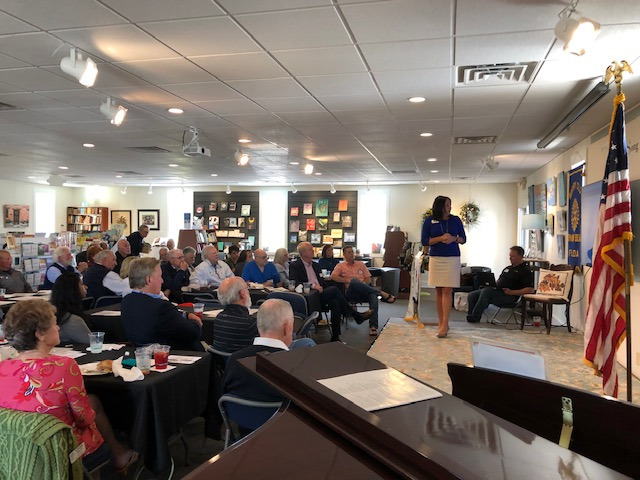 In attendance were Club Members.total attended the meeting. 50/50 Jack Pot: @$ -Rotarian had the drawn ticket and drew the ! 41 cards remaining. Again, due to my absence, there was very little information shared with me for this weeks News Bulletin. If topics are blank, there was no report given. Antoinette announced that she will be collecting Toiletries to bring with her to the March 7-9, 2019 - President-Elect Training in Orlando. Please contact Antoinette for further information about donating. 1 Oratory Contest coverage (with photo) and Scholarship Luncheon Coverage have gone to NL. 2 Scholarship application availability is being published in the NL. 3 Blood Drive dates and info will go to NL at end of Feb.
4 Volunteer Recognition Breakfast Prices are Locked: Single seat: $15; full table of 8: $100; half table of 4: $50. 5 Volunteer Recognition Breakfast Collateral Materials will be available in 1-2 weeks. 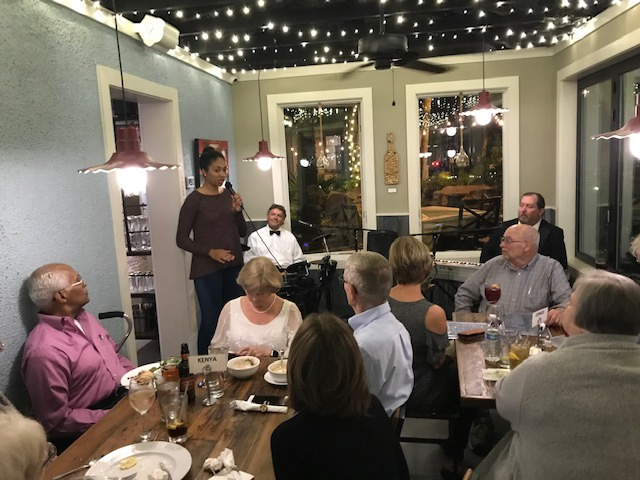 President Ron attended a speech contest held at the Patio Place this past Wednesday night. Katie Slaughter was there practicing for the Rotary Oratory Contest....she placed 2nd. Thursday night was the Oratory Contest but I have no info on the results as yet. We will announce in the next News Bulletin. Due to a scheduling conflict with Story and Song, there will be no meeting next Wednesday (February 27. Mark and Donna have a bi-annual workshop scheduled for most of the week. I will accept full Presidential responsibility for the oversight! We are working on a possible alternate location or possible social, but at this time our next meeting will occur on March 6th at the regular time and date. Thank you to Sean McGill and the Katie Ride for your flexibility - we'll see you on the podium soon! 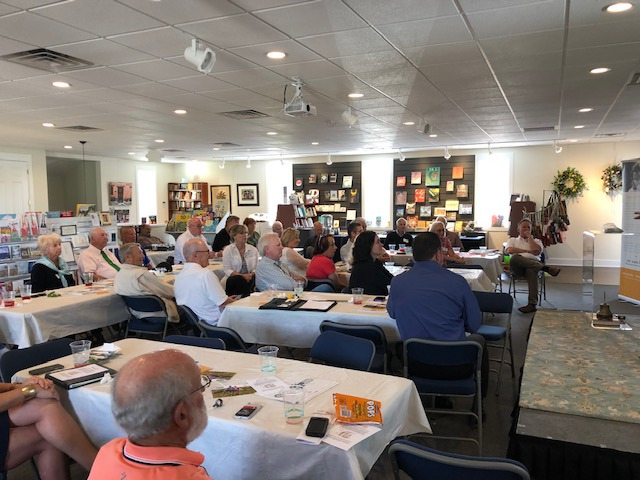 "Tallahassee's Impact on Nassau County"
"Gamble Rogers: A Troubadors Life?" "My Rotary Exchange Student Year"